Description: A Wii Remote Plus that was bundled with the limited edition of The Legend of Zelda: Skyward Sword. This is a list of VGCollect users who have Golden Zelda Wii Remote Plus in their Collection. This is a list of VGCollect users who have Golden Zelda Wii Remote Plus in their Sell List. 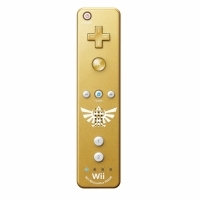 This is a list of VGCollect users who have Golden Zelda Wii Remote Plus in their Wish List.